Action from the Thorney 5. Nene Valley Harrier Edgars Sumskis enjoyed a comfortable win in the Barney Memorial 5k at Ferry Meadows with clubmate Jordan Foster the first lady over the line. The double success for the organising club was a fitting tribute to the late Mike Barnsdale, in whose memory the race is run. The former Nene Valley chairman would’ve been pleased with the camaraderie on display early in the race when Paul Houlden dropped out to help his Nene Valley team-mate Sean Beard after the 52 year-old was involved in a tangle of feet that resulted in him hitting his head on a bollard. Sumskis led all the way crossing the line in a speedy 15:17 giving him a 31-second margin of victory over runner-up Dave Hudson of Huntingdon club BRJ. Peterborough AC’s Dominic Moszkal finished third just one second behind Hudson and Shaun Walton, also of PAC, was fourth with a 16:12 clocking. Sixth-placed Phil Martin ran 16:30 and ensured that the men’s team prize went to PAC. Jordan Foster was too good for the rest of the ladies winning in 18:31 with PAC’s Grace Mullins second in 19:18. 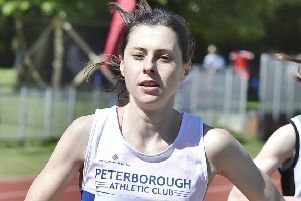 Sarah Caskey, also of PAC, finished third in 19:47 and Josie Fortune and Chelsie Bole, seventh and ninth in 20:33 and 21:00 respectively, ensured Nene Valley took the team honours. PAC’s Benji Davis was first Under 17 male to finish in a time of 18.21. BRJ man Hudson went one better on Sunday when winning the Thorney 5 and it was normal service from Peterborough AC who won the men’s team prize. Hudson battled the strong wind to win in a time of 26:17, some 50 seconds ahead of the second-placed Phil Martin of PAC. His 27:06 was a PB. Adam Bowller of North Herts was third in 27:28 while Nathan Popple (11th) and Steve Hall (14th) ensured the team prize went to PAC. March AC pipped Nene Valley for the ladies team prize with Tony Alcaraz first over the line in 31.59. Ramsey’s Lisa Marriott was second in a time of 32:22 and Melissa Neal of March AC third with a 33:46 clocking. The Nene Valley trio of Laura Grimmer, Emma Penniston and Yvonne Scarrott finished fifth, sixth and ninth, but Geraldine Larham was the third March runner across the line in 10th to ensure team honours went to the Fenland club. Elijah Goodwin of host club Thorney Road Runners won the junior 3k in 11:23 with Nene Valley’s Chelsie Bole hot on her heels finishing as runner-up in 11:30.